For the past six months, I've been working reallllllllly hard to cut back on my sugar intake. You don't need to do excessive research to know that Americans consume entirely too much sugar. If you take a peek at any nutrition label in your fridge or pantry, chances are sugar is not only one of the listed ingredients, but one of the main ingredients. Not good. My quest to decrease sugar consumption started when my friend Sarah told me about her recent lifestyle change of cutting out all refined sugars. Do what?!? The thought of never eating foods that contained refined sugars was a foreign concept that I could not wrap my brain around. If you are one of those people who'd rather have two servings of dessert at the expense of skipping dinner, you know what I mean. But this is what made me realize that I needed to make a change-I was addicted to sugar. So, after pouting for a few days, I finally made the commitment to cut back on my refined sugar consumption. Here I am six months later, eating better, feeling better, and not always craving sugar! I've also noticed that I have more energy. It's amazing how foods can affect your body in ways that you don't even realize. While I still occasionally treat myself (everything in moderation), I have managed to maintain a low refined sugar diet. How?, you ask. 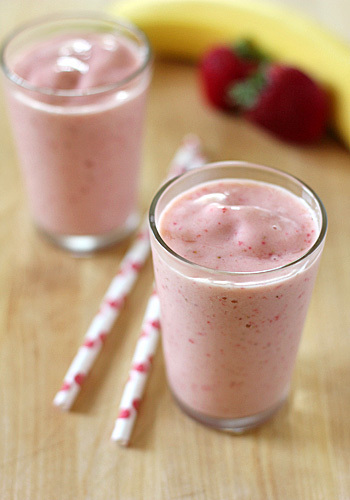 Smoothies. I live for smoothies. Not only are they cold and creamy (a perfect substitute for that late night ice cream craving), but they are packed with nutritious and naturally sweet fruits. So do your body a favor, pull out that blender, and whirl up this delicious (my all-time favorite) smoothie. Add all of the ingredients to a blender, starting off with the ice. Blend for 30 seconds, or until all of the ingredients are thoroughly mixed. If you want a thicker smoothie (more like a slushi), add another handful of ice; blend until smooth. Drink immediately. I've been making a smoothie for breakfast for over a month now! And I also use unsweetened almond milk =) I'm trying to add veggies now, cucumbers and bananas are good mix. You should try to add whey protein. Great blog btw, I'm looking forward to it! Thanks for the comment Jenny :) I will definitely try whey protein! Any brands you recommend? Skinny One Ingredient "Ice Cream"